Ian Tilmann was a Street Skater who loved to Longboard with his crew until the wee hours of the morning. Ian had a Longboard passion for bombing hills, garages and sliding ramps and truck wells. Ian had a Street Skaters attitude about helmets…he did not think it was cool or necessary to wear one when Skating. In 2005, on a warm July evening Ian took off with his crew to bomb “Cemetery Hill” in Clearwater Florida. Ian had bombed that Hill a 1000 times and yet that night was his last, as he was thrown from his Longboard after a “speed wobble & wheel bite”. Ian suffered Traumatic Brain Injury (TBI) from a deep skull fracture and was rushed to the hospital. Ian was in coma for ten days as Surgeons and Nurses struggled to save him. On July 26, 2005 Ian died. Ian’s Mom, Dad and family were devastated by Ian’s death and the inevitable question; Why did this happen? Would a helmet have saved Ian’s life that fateful night? The answer to that question and how Ian’s Mom, Marcy Tilmann resolved these issue are shared in Ian’s Story by Roxanne Wilder of Catch 47 TV Tampa Florida. This heartfelt report is an excellent introduction to Marcy Tilmann, the Mom who decided to reach all Skaters. SKATE SMART ... WEAR A HELMET ... LIVE TO SKATE TOMORROW™! Learn more about Ian Tilmann and his life growing up in Clearwater, Florida. Ian was a musically talented, played brass horns Band and Bugle Corps. Ian was a US Marine and joined upon turning 18. After 4 years and his Honorable Discharge Ian returned to civilian life to pursue his dreams. Learn more about Ian and how his dreams were cut short by a tragic Life Decision at: About Ian Tilmann. Helmet Nation is an OPT-IN movement of Skaters who choose to wear helmets whenever they Skate. Helmet Nation seeks commitment to promote Skating “Smart” knowing full well there is nothing safe about extreme action sports and Skateboarding in particular. Many Skaters know the truth because they have been there, fallen many times as they became Masters of the sport. Most Skaters are in total denial about the risks of TBI and the need for helmets. The fact is in 2009, over 23,000 head injuries were treated in Emergency Room from Skateboarding. That equates to 3 Skating TBI’s every hour of every day for the entire year. Helmet Nation knows the facts and make the smart choice to wear a helmet when ever they Skate. There is only one proven cure for Traumatic Brain Injury….it is called PREVENTION! Old School Skaters (Over 30) are stepping up to volunteer their time and effort to build Helmet Nation. Old School Skaters have learned from experience the value of a good helmet. Pro Skaters Steve Steadham and Lester Kasai have joined Helmet Nation and promote Skate events across the Nation in partnership with the Foundation and our Sponsors. Helmet Nation volunteers produce Skate events benefiting the Foundation at public and private Skate Parks; Youth Clubs, and Skate Ministries. Longboard Clubs from communities and campus are holding Rallies, Contests and “Skate-athons” to raise funds for helmets. Helmet Nation is driven by the desire to “Pay It Forward” and help other Skaters who need helmets but can not afford them. Helmet Nation works together to raise funds for the “Helmet for a Promise” program. We ask smart Skaters everywhere to step up and join our movement to build Helmet Nation in the Skate World…one Brain at a time. 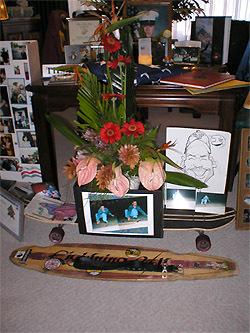 The Ian Tilmann Foundation, Inc. operates in memory of Ian Tilmann who died from a Skateboarding accident in 2005. The Foundation was established in November, 2005 by Marcy Tilmann, President with funds donated for Ian’s rehabilitation while he was in the Hospital. Marcy launched the “Helmet for a Promise” program from her home where it still operates today. Since Ian's death the Foundation has given over 3,500 FREE Helmets to skaters who promise to wear them. The Ian Tilmann Foundation, Inc. was incorporated in November 2005 as a Florida Non-Profit corporation. The Foundation is certified as a Public Charity under the Internal Revenue Code 501(c)(3) with Florida Tax Exemption Certification. Make a donation to the Ian Tilmann Foundation!